Price: Let’s be honest, this is probably the most important factor. As long as neither option is a piece of junk, the price of OEM parts versus universal parts will be a leading influence of which route you end up taking. Generally, universal parts are 25-60% less expensive than OEM parts. Quality: Like many products, all HVAC repair parts do not carry the same standard of quality. The last thing you want, especially during the busy season, is a customer calling you back to a job because one of the repair parts you used crapped out. Warranty: If the system is still under warranty, it may require you to use OEM parts for the repair. Availability: Consider the availability of OEM parts versus universal parts. Are they in stock? If not, how long will it take for them to arrive? To save time and give themselves peace of mind, a lot of techs default to going the OEM route, but there are scenarios, a lot of scenarios actually, where universal parts make sense. Today, a lot of contractors are relying on their distributors to help them make the decision instead of using their precious time and company resources to assess the quality and price of different repair parts. Distributors like US Air Conditioning Distributors (USACD) have vast knowledge of all the different parts available on the market and can help you decide which parts are best for almost any scenario. USACD stocks both universal and OEM repair parts, requiring that their manufacturers maintain strict quality standards in order to stay on their shelves. Our software and well-versed team at the parts counter can help you asses your specific scenario, consistently finding you affordable, high-quality parts. Afterhours service calls where the tech diagnoses that the run capacitor has failed. You can stock your truck with universal capacitors and have this customer up and running quickly. It would be impractical and expensive to stock OEM parts for various brands in your truck. A furnace with a failed induced draft motor. Distributors can identify the motor type and size you should stock that will fit thousands of models. A failed defrost board in a heat pump that is out of warranty. There are several options for universal defrost boards. While some units might require an OEM part, most are easily fixed with a universal replacement part. And the cherry on top is that there are some out there that are equal in quality but less expensive in price! While there are endless scenarios that make sense to use universal parts, keep in mind that certain parts are only available from the Original Equipment Manufacturer – like heat exchangers and condenser coils. 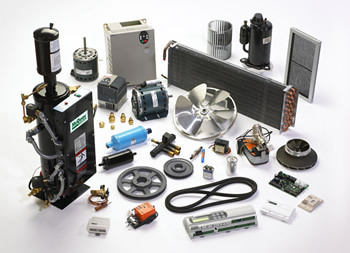 Whatever parts you need, whether they be OEM or aftermarket universal, US Air Conditioning Distributors has you covered. If you need it, we have it.